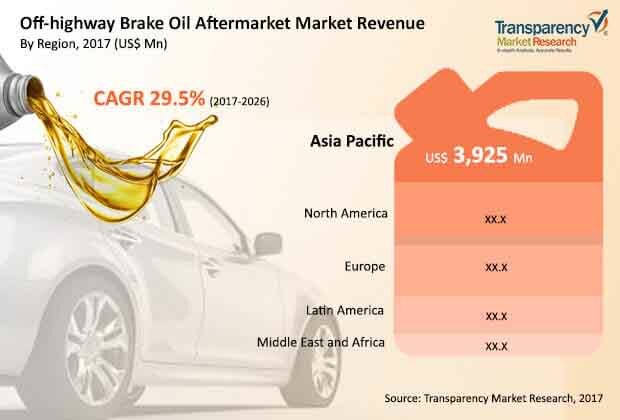 The global off-highway brakeoil aftermarket was valued at US$ 10,614 Mn in 2016 and is anticipated to expand at a CAGR of more than 5.0% from 2017 to 2025. In terms of volume, the global off-highway brakeoil aftermarket stood at 1,320 tons in 2016 and is expected to expand at a CAGR of 5.0% from 2017 to 2025 according to a new report titled “Off-highway Brakeoil Aftermarket - Global Industry Analysis, Size, Share, Growth, Trends, and Forecast, 2017–2025,” by Transparency Market Research (TMR). Brake oil plays a vital role in the braking system of a vehicle, as it transfers the force created when a driver presses the brake pedal directly onto the wheel hub. Brakeoil is a type of hydraulic fluid used in hydraulic brake and hydraulic clutch applications in automobiles, motorcycles, light trucks, and off-road vehicles. It is renewed or changed every one to two years in off-road vehicles in order to improve their safety and durability. This is boosting the off-highway brakeoil aftermarket across the globe. Numerous brands specific to manufacturers of brake oil are available in the market. Off-highway vehicles are widely used in mining and construction industries. Larne numbers of aging off-highway vehicles require periodic or scheduled maintenance. This is likely to boost the demand for brakeoil. New orders for off-highway vehicles are also rising. This provides an opportunity for the existing as well as new players to penetrate the highly competitive off-highway brakeoil aftermarket. The construction sector is set to become one of the driving forces to develop infrastructure. The construction sector in the U.S. is expected to continue to expand due to the increase in demand for real estate and infrastructure projects. Thus, growth in construction and mining sectors is one of the major factors boosting the off-highway brakeoil aftermarket. The Government of Brazil has created the Programme of Investment Partnerships (Programa de Parcerias de Investimentos) to increase the contribution of private capital in infrastructure projects in the country. The Mining Association of Canada (MAC) is the national organization of the mining industry in the country. It has increased mining activities to meet the needs of the growing population. Increase in demand for electric vehicles and volatility in prices of crude oil are estimated to hamper the demand for brakeoil in the near future. The braking system in a vehicle needs periodic brake oil changes to ensure reliability and safety. Moisture diffuses into the oil through brake hoses and rubber seals. This eventually leads to brakeoil replacement when the water content in the braking system becomes too high. In the agriculture sector, governments provide subsidies to yield better output in order to meet the needs of the growing population. Governments also offer subsidies for promoting organic farming. This is projected to boost the demand for brakeoil in off-highway vehicles such as tractors, forklifts, and bulldozers. The agriculture sector is likely to expand at a steady pace in the near future owing to the increase in population. Thus, the usage of off-highway brakeoil is likely to rise moderately in the next few years. Brakeoil helps reduce friction between surfaces. It is usually available in oily, semi-fluid, or solid state. Superior-quality lubricants possess various characteristics such as a high level of thermal stability, high boiling point, low freezing point, and high viscosity index. These features help reduce friction between surfaces of machine parts and increase operational efficiency. In terms of type, DOT dominated the global off-highway brakeoil aftermarket with more than 50% share in 2016. This trend is expected to continue during the forecast period. Expansion of the segment can be ascribed to the rise in demand for silicone-based brake fluid. DOT 5 based brakeoil has advantage over other forms of brake fluid. The silicone offers stable viscosity index over a wider temperature range and does not damage paint. DOT 5 brakeoil does not destroy seals. Based on end-user industry, mining dominated the global off-highway brakeoil aftermarket with more than 30% share in 2016. This trend is anticipated to continue during the forecast period. Increasing numbers of off-highway vehicles are used in the mining industry vis-à-vis other end-user industries. This is estimated to propel the demand for brakeoil in existing as well as new vehicles. In terms of revenue and volume, Asia Pacific held the major share of more than 32% of the global off-highway brakeoil aftermarket in 2016. Countries such as China, India, Vietnam, and Indonesia are experiencing major economic and infrastructure development. This can be ascribed to the rapid industrialization in the region. India, China, and Australia are dominant countries in the mining of minerals, metals, non-metals, and ores. Globally, Australia is ranked second in terms of year-on-year mining of gold. Furthermore, these countries employ majority of off-highway mining vehicles. This is anticipated to boost the market in the near future. The global off-highway brakeoil aftermarket is a highly competitive. The leading players dominate the market . In terms of market share, Royal Dutch Shell dominated the off-highway brakeoil aftermarket with more than 12% share in 2016. The company started various downstream operations in different parts of the world in 2015. This includes a lubricant plant in Tianjin, China, with expected capacity of 330 million liters per annum. Other players include BRB International BV, Halron Lubricants Inc., Lukoil Lubricants Company, Phillips 66 Lubricants, Royal Dutch Shell plc., Indian Oil Corporation Limited, Castrol Limited, Chevron Corporation, BP plc., Total S.A., ExxonMobil Corporation, Fuchs Petrolub SE, and Topaz Energy Group Ltd.